During a Root Canal procedure, the area surrounding the tooth will be numbed, so you will not feel any pain during the treatment. A highly skilled dentist will remove the damaged pulp and clean and disinfect the inside of the tooth. The root canals will be shaped, and a rubbery substance called gutta percha will fill the inside of the tooth to prevent the infection from coming back. Afterward, a crown will be placed over the tooth to protect and strengthen it. After this procedure, your tooth will function normally. If you have a toothache, you should see your dentist right away. This could be a sign that a root canal is needed to save the tooth from infection. The dentists at Ocean View Dental Group have years of experience in root canal treatment. 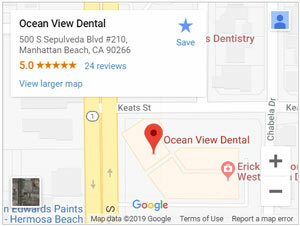 Call our office in Manhattan Beach, to ask our friendly and capable staff any questions you might have about a root canal procedure.